07/2010 Update: The district has been included in the Upper Freehold Farmland Byways project, which is currently in the federal approval stage. Unfortunately, not much else has changed about the district since its nomination. The situation remains static as the governing body is unsympathetic to preservation efforts. 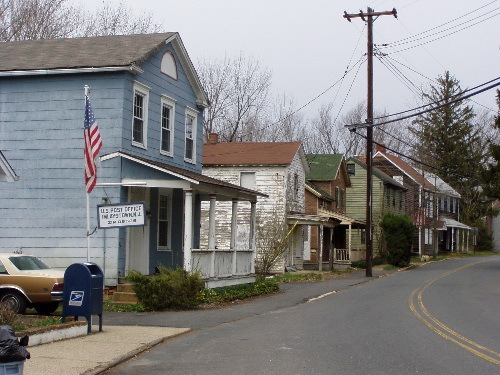 This village was once the social, economic and political focus of Upper Freehold. It consists of approximately thirty, mostly mid-nineteenth century structures that were rebuilt in 1898 after a fire. The most recognizable building in Imlaystown, which takes its name from the Imlay family, the area’s major landowners in the colonial period, is Salter’s Mill situated on a 28-acre millpond that once supported an ice business as well as the mill. While the village was somewhat revitalized in the 1990s many of its buildings are now dilapidated. Some are currently uninhabitable due to septic issues created by the proximity to Doctor’s Creek. The significance of Imlaystown lies less in the merits of individual buildings than in the overall feel of a mid-nineteenth century streetscape that appears to have been almost frozen in time. Upper Freehold’s recent Master Plan addresses the preservation of historic structures, rural character, and open space. PNJ believes that there is no better place to confront these issues than by halting the decay of Imlaystown.